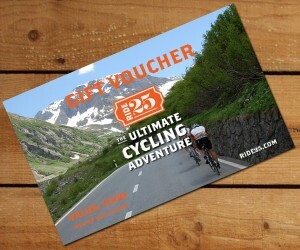 Why not give your partner or friend the gift of an amazing cycling holiday (or voucher towards it) for Christmas? Have they dreamed of cycling through the Alps, but haven’t plucked up the courage to ask to go away on that amazing cycling holiday? Or maybe you want to come along and you can buy them the voucher to come with you too! We have been asked several times to provide Ride25 Gift Vouchers for Birthday presents in the past so for this Christmas we thought we would make it even easier to buy one. Just fill out the info below and we will get a voucher in the post. Last post in time for Christmas is the Monday 21st December 2015 or the 23rd December 2015 using Royal Mail Special Delivery. We can provide an electronic .pdf voucher for you to print out right up to Christmas Day if you prefer. For gift voucher ts and cs please read here. Give the gift of an ultimate cycling adventure!